Yesterday I wore my green boubou with intricate gold embroidery in the front for a special African celebration. To say that I looked like royalty is simply an understatement. I looked majestic! So, for starters, you might ask me what is a boubou? Well, a boubou (or bubu, or grand boubou, or grand bubu) is an African garment worn by men and women in much of West Africa, and parts of Central Africa. The boubou generally consists of up to three pieces: a long-sleeved shirt, a pair of tie-up trousers that narrow at the ankles, and an open-stitched overflowing wide sleeveless gown worn over these two; all three are usually the same color, and were historically made from silk, but nowadays are made up of cotton or sometimes synthetic fabric made to resemble silk. The whole will be incomplete without a hat or chechia of any color. A woman’s boubou would differ from a man’s boubou by the fact that it will consists of two pieces: a wrapper at the bottom, and a large overflowing gown to top it all off, and of course an intricate headscarf. Its name comes from the wolof ‘mbubb’, which made it into French, as boubou. 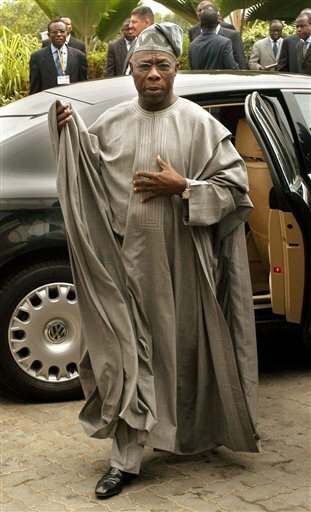 In Yoruba, it is known as agbada; in Hausa, it is babban riga, while in Tuareg, it is k’sa grand boubou. The tradition of the boubou is old, and can be traced back to as far as the 8th century. Its origin lies with the clothing worn by the Islamized Tukulor (Toucouleur), Mandé, and Songhai peoples of the great Takrur and Ghana empires, and 13th century Mali and Songhai empires. In West Africa, the nobles of the different people were already wearing a garment more or less similar to the actual boubou. The different patterns in the embroidery already had precise meanings which varied for different ethnic groups and regions. The rest of the population, in majority craftsmen and farmers, wore garments similar to tunics for the upper body, and a wrapper or baggy trousers for the lower body. 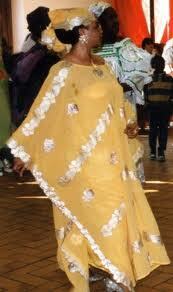 In the past, in West Africa and Central Africa, only Islamized peoples used to wear the boubou: Fulani, Toucouleur, etc. … the other ethnic groups all had their own traditional garments of more or less similar genre. With trade among the peoples, the fashion industry, many African stylists (such as Alphadi) have specialized into the boubou and it has now gained international exposure. The video below is short and simple, and addresses the boubou. It is a small documentary from Arte. Enjoy! « Commemoration: 11 April 2011, the day Côte d’Ivoire was defaced! Hi I have been trying to get my hand on a real Nigerian Grand boubou for a few years. The ones online look cheaply made. How can I get one custom made for my measure and in the color that I want? Thanks for linking to my article.